NASA dropped a test version of the Orion crew capsule from the back of a U.S. Air Force cargo plane Wednesday in a final full test of the spaceship's parachutes before Orion's first space mission in December. The 10-ton test article fell from an Air Force C-17 transport aircraft at an altitude of 35,000 feet, dropping in a free fall for 10 seconds before beginning a sequence of parachute deployments to slow the craft's descent to the U.S. Army's Yuma Proving Ground in Arizona. The parachutes unfurled in three stages, first to jettison a forward bay cover on Orion's conical end, exposing the next set of chutes. Then drogue parachutes deployed and released to pull out the capsule's orange and white main parachutes. 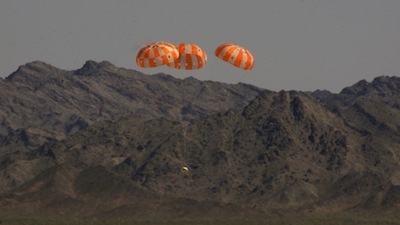 The 116-foot-diameter main parachutes -- three in all -- inflated as designed before the Orion spacecraft settled onto the Arizona desert floor. One of the main chutes was rigged to skip a step in its three-phase inflation sequence, testing its ability to rapidly inflate in the event of a problem during descent on future Orion space missions, NASA officials said. Wednesday's test was the 14th of 17 planned airdrops to validate Orion's parachutes, and it was the last time all of the Orion spacecraft's parachutes will be tested together before the vehicle's first unmanned orbital mission in December. "We've put the parachutes through their paces in ground and airdrop testing in just about every conceivable way before we begin sending them into space on Exploration Flight Test-1 before the year's done," said Mark Geyer, Orion program manager at NASA's Johnson Space Center. "The series of tests has proven the system and will help ensure crew and mission safety for our astronauts in the future." The EFT-1 mission will last about four-and-a-half hours, reaching a peak altitude of 3,600 miles after launching on top of a Delta 4-Heavy rocket from Cape Canaveral, Fla. After a re-entry with speeds of up to 20,000 mph -- nearly the velocity of a capsule returning from the moon -- Orion will splash down in the Pacific Ocean at the end of the test flight, where a U.S. Navy recovery team will retrieve the capsule and return it to port. The capsule's ablative heat shield and parachutes will reduce Orion's velocity from 20,000 mph to about 20 mph for splashdown. Another automated test flight -- called Exploration Mission-1, or EM-1 -- is set for late 2017, and Orion's first crewed mission is scheduled for 2021. Built by Lockheed Martin Corp., the Orion spacecraft is designed to carry astronauts beyond low Earth orbit. It is capable of flying missions to asteroids, the moon, Mars and other destinations. According to Stu McClung, Orion's landing and recovery system manager, NASA plans another parachute test in August aimed at simulating the combined failure of one drogue and one main parachute. The final two drop tests planned over the next few months will complete the series of airdrops. "Once we're done with those, we'll take the lessons learned and start building our final design that will go into the vehicle for EM-1 and our future human missions," McClung said in a Google+ Hangout.